The Theatre Center is constructed from concrete block and is much larger than it appears on the outside, mostly due to the sprawling basement area of dressing rooms and storage areas. The auditorium of the theater is rather narrow and was built like a modern movie house with a sloping floor and flip-up seats. But there is something in this theater --- something that is said to watch those who enter and leave the place. It hides in the darkest corners of the building, lurking and waiting to make itself known to anyone who dares scoff at its existence. The Springfield Theatre Guild was founded in 1947 and within a couple of years had managed to raise enough money to build a theater in which to hold their performances. The site was located at 101 East Lawrence Avenue and the construction began in 1950. The first theater season was in 1951 and they opened with the Broadway hit, "Born Yesterday". One of the actors involved during the early days of the Guild was Joe Neville, a rather strange and eccentric performer who was not well liked by other cast members. Apparently, he was known for his arrogance and was unusually difficult to get along with. He also had a massive ego, but was a talented actor, so everyone made an effort to overlook his attitude. In addition to his acting ability, Joe was said to have had a questionable past as well. Rumor had it that he had also done some acting and directing in England, under another name. After his death, his will was read and he apparently left a lot of land in England to various people. The problem was that Joe didn't own any of that land. As mentioned, Joe was regarded as a pretty strange and unpopular guy. His death was taken so lightly by other Theatre Guild actors that the lead role he was slated to play in an upcoming production was simply given to another actor on the night before it was scheduled to open. I guess the show really must go on! Joe Neville in a publicity shot that was taken for the Theatre Guild. 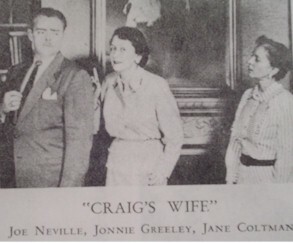 A publicity shot for a play called "Craig's Wife". Joe Neville appears at the far left. "If there was anyone who was going to come back as a ghost, it would be Joe," said Tom Shrewsbury, a long-time member of the Theatre Guild and a man who has had more than one encounter with the theater's resident ghost. He is also one of the remaining actors who worked with Joe Neville in the old days of the Guild. "I knew Joe from many, many years ago, back in the 1950's," Shrewsbury explained. "We were doing a show called "Mr. Barry's Etchings" and Joe played the lead. One night after dress rehearsal, Joe went home and committed suicide. There was apparently an audit of the books at that place where he worked. A lot of money had been misappropriated and it looked as though Joe would be caught the next day." Many people feel that Joe's suicide is the reason that he haunts the theater. It may also be the unfinished business of the play that causes him to linger behind. He may have felt the audit cheated him out of his chance to play the lead role in the performance. As the theater was undoubtedly the only place where this bitter man was happy, his spirit probably has no desire to leave it. His need for attention, in life and in death, is evident. As the years have passed, many staff members and performers have reported weird happenings here. They have also discovered that sometimes a disbelief in Joe's ghost can trigger the events to take place. "Whether you believe in him or not," one of the actors here once told me, "you don't say out loud that you don't believe in him.... because then things happen." He went on to describe an unusual occurrence that took place one evening when he and another man were building a set for an upcoming show. The friend who was working with him was skeptical about Joe's existence and made a point of stating this while onstage. "The power saw he was using started up by itself," the actor told me, "and as soon as it did, some sheets of plywood fell over and a ladder that was standing nearby fell over on its own. The saw started to rev up again and right then my friend shouted 'I believe, I believe!'" But skepticism is not the only thing that makes Joe show up for sometimes he makes an appearance for no reason at all. One of the most repeated happenings in the theater involves the front counter, located in the building's lobby. Many people, including patrons with no knowledge of the theater's haunted history, have noticed the door to the counter will swing open and closed on its own. Actors and staff members tell weird tales of Joe's presence. These anecdotes involve props and objects falling from the rafters and striking people, staff members being pushed offstage and on one occasion, a filmy, white apparition that appeared on an overhead catwalk. Colleen McLaughlin, one of the actors at the theater, has had a number of experiences that qualify as being ghostly. She has often noticed the tendency of things to appear and disappear around the theater. One night, during the run of a show, she had to make some very quick costume changes during a particular song. She ran offstage, changed and then went back on. A few moments later, she returned to change her clothing again. This time, she got a surprise. "Everything was missing, " she told me. "It turns out they [her costume] were behind a stairwell, all folded up neatly. No one used that stairwell during the production, and we have no idea how the clothes got there. They had been next to the piano when I came on and off stage. No one saw them disappear... and no one could have taken them." 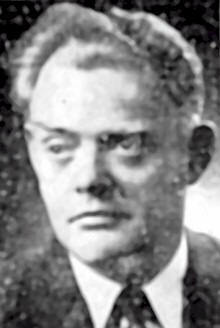 Other actors have experienced similar incidents on many occasions, including Rebecca Sykes, the former theater manager. One night during a show, the clothing she was supposed to change into also disappeared. It was found later strewn up and down a ladder in the back, a place where no one had gone during the show. The actors are not the only ones troubled by the ghost however. The people who build the sets and props sometimes have even stranger encounters. One night, a stage crew volunteer was alone in the theater, painting a set for an upcoming show. He used a roll of tape to mark off areas where set pieces would be placed. He finished with one section and laid the tape aside. A few moments later, he reached for it, but it was gone! Thinking that he must have used the last of it, he decided to call it quits for the night. He closed up his paint cans and moved them up to the front of the stage. He went behind the curtain and was about the shut down the stage lights when he spotted his missing tape roll. It was propped up next to the last can of paint he had moved to the edge of the stage and there was no doubt that it had not been there seconds before. He left the theater in a hurry that night! I had the chance to visit the Theatre Center in the early part of 1997. I had the opportunity to spend several hours touring the place and interviewing actors and staff members about their encounters with Joe's ghost. I heard a number of familiar stories and some new ones from theater regulars, who all expressed respect, and a sort of fondness, for the ghost that haunted the place. Before interviewing the staff, I was able to wander about the building on my own. As I may have mentioned, the lower regions of the theater are much larger that you might expect. Besides the spacious reception room, there are also many rooms for storage, bathrooms, a furnace room, and several small dressing rooms. I also wandered about the stage and the auditorium, not knowing what I would find, but hoping to find something. My self-guided tour eventually led me down a back staircase from the stage to a dressing room at the bottom of the steps. This dressing room was apparently used mostly during the early days of the theater. A new addition to the building had been constructed years after the original work and today, there are newer dressing rooms to use upstairs. The room at the bottom of the stairs is seldom occupied now, except apparently, by Joe. Of course, I didn't know that at the time. As I walked into the room, I suddenly caught a strange smell near the center. I identified it immediately as the overpowering stench of Noxzema. To be honest, I really thought nothing of the smell. This was a theater after all, and the use of Noxzema was undoubtedly common. I shrugged the whole thing off and continued with my tour. Later on, I got quite a surprise when Rebecca Sykes told me that one indication they had of Joe�s ghost being present was the smell of Noxzema in the air. Because of this, superstitious actors had banned the use of the cream from the theater years before. So, whatever I had smelled in that room had not been the lingering odor of an actor who had removed his or her make-up. "They say that Joe had this horrible rash on his legs that never seemed to heal," Rebecca explained when I asked how the smell had been linked to the ghost. "He used to slather layers of Noxzema on them. I guess that everywhere he went, you used to be able to smell it around him." I would have loved to laugh the whole encounter in the dressing room off to nothing more than my overactive imagination, but that would be impossible to do since I had no idea of the tell-tale "smell" until after I actually caught a whiff of it. That seemed to rule out the idea that it was just my imagination. To this day, I believe I came face to face with Joe Neville!